. Published on March 8, 2018 . Hello yet again, reader, from a slightly sleep-deprived last semester thesis student (that’s me)! I write to you trying my best to ignore the involuntary twitch that periodically shows up in my left eye and instead focus on being positive and forward-looking as this semester rapidly marches on. I’ve said it before but it bears repeating that time in each semester seems to pass at an astronomical pace, something that is especially evident as I work toward mounting my thesis work. Before talking more on that thesis work shortly, I’d like to tell you about my recent trip to the 106th Annual College Art Association Conference in Los Angeles, which was nothing short of amazing even in spite of the unusually brisk weather in L.A.
One of the amazing views available at any moment in L.A.
Before heading out west, I had to attend to some thesis housekeeping, testing what some of the elements of my proposed installation would look like, practically, in the Glass Curtain Gallery space. More specifically, I was testing what projection in a fully illuminated gallery—and, what’s more, the actual gallery in which I will be presenting my thesis work—would look like. And while I have been prototyping this in my studio for some time now, there is nothing that can supplant testing in the real site where work will be installed. Testing my projection in the Glass Curtain Gallery space. After getting this trial run done and with the good fortune of receiving the first annual Judson-Morrissey Excellence in New Media Scholarship (furnished by the New Media Caucus) to attend the conference, I started my trip to L.A. on quite the positive note. As I checked into the perfect mid-century Hollywood Airbnb, I was given yet another telling indication of an excellent trip ahead. 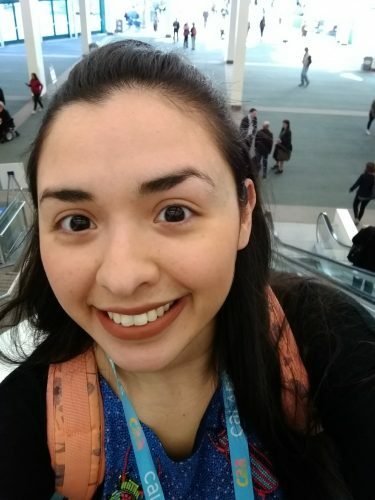 My first day at the conference was overwhelming in the best possible sense of the word. In the morning, I attended a session on the utilization of portraiture in photography to claim agency, something that felt deeply relevant to my current work, followed immediately by a panel concerning how personal background and identification affect one’s ability or right to create work connected to specific social issues. I followed this busy morning with one of many amazing meals had in L.A. It seems like a mundane detail to include, but I truly felt like Los Angeles’ food was a reflection of one of its best qualities, its eclectic mix of cultures and people which, in turn, made it such an excellent site for this conference. Another one of the many great cultural experiences I had on this day–made possible by my CAA attendance–was visiting the Broad museum after hours, taking in contemporary artwork in a private setting. 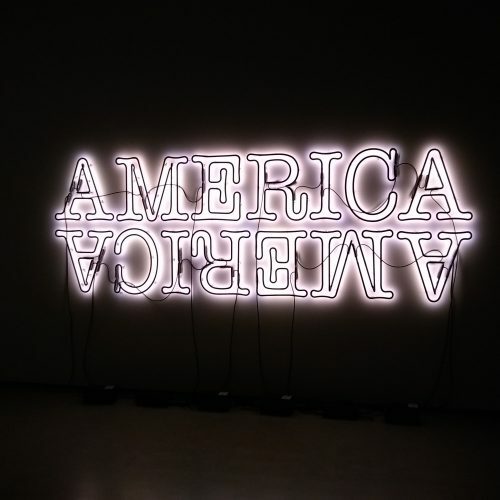 Glenn Ligon’s “Double America 2” at the Broad, a piece that seemed to be very specifically speaking to me. The following day I joined Graduate Admissions staff at Columbia’s booth at the CAA conference, representing our graduate programs on this stage and getting to see first-hand what our Graduate Admissions office does out in the field. Later that day, I met the members of the New Media Caucus, whose award again helped to subsidize my trip to CAA in the first place. 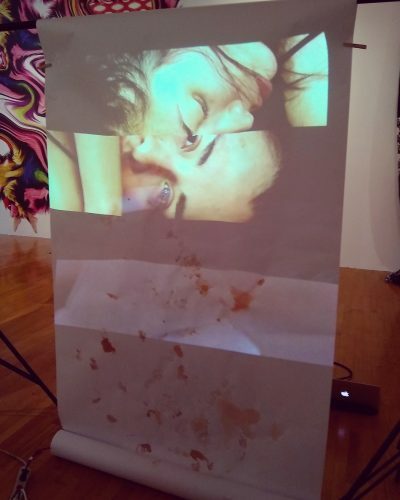 While attending the New Media Caucus’ showcase that evening, I got another exclusive look, this time at what other interdisciplinary contemporary artists are out in the real world making and doing. The next couple of days were again so much to take in and included more amazing meals, neighborhood exploration, museum visits, and conference sessions. In short, my few days in Los Angeles were as active as they were culturally and creatively enriching. The face of an enlivened grad student at CAA. Now back from that brief excursion, I am focusing once more on executing my thesis work, which has again seen many changes since I wrote last. At present, I am working at full capacity to create and coordinate all of the multi- and inter-disciplinary aspects of that thesis installation piece, working in a frenzy to complete this mad dash of thesis!